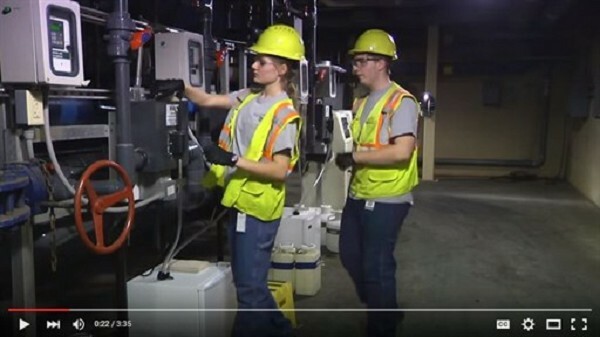 Young people in Green Bay, Wisconsin, learn how to manage water and waste water facilities as part of an apprenticeship program. Apprenticeships: they're not just for the building trades anymore. Youth apprenticeships -- the pathways from high school and college to well-paying jobs -- are increasingly in the national focus of workforce development. New fields now offering apprenticeships as a route to good jobs -- some paying as high as $50 per hour -- including energy, health care, information technology and advanced manufacturing. School-to-Work Pathways is a local non-profit organization with the intent of joining the mid-Michigan area and the national program called PAYA, Partnership to Advance Youth Apprenticeship. Under the guidance of the Michigan Talent Agency, the local program has been designated "STEM Pre-Apprenticeship Program." Advocates from the business and corporate worlds are urged to join educators to support this effort, a supplement to existing programs of the Bay-Arenac Career Center and Michigan Works, said Dr. Tim Eckstein, associate board president of School-to-Work Pathways. School to work transition is a process that young people go through when they leave school. According to experts, an STW system should incorporate work-based learning, including work experience, mentoring, and industry-specific skills. It should also include school-based learning, incorporating high academic content and standards. It must also provide those connecting activities, matching students with employers and post-secondary work opportunities. "We're seeing more and more young people -- particularly black and brown youth -- piecing together part-time, low-wage employment and struggling to balance the multiple demands of school and work," says Allison Gerber, a senior associate at the Annie E. Casey Foundation. She adds that postsecondary education can be unaffordable and doesn't always provide the skills for which employers hire. Cue a promising repair tool for these pathways: Youth apprenticeship. The right apprenticeship can link the education and training needs of young people with the talent demands of employers. Participants can complete high school, start their post-secondary education at no cost, get paid work experience alongside a mentor and start along a path that broadens their options for the future. With these benefits on record, the nonpartisan think tank New America has recently launched a multi-year multi-stakeholder initiative called Partnership to Advance Youth Apprenticeship -- or PAYA. This Casey-supported effort will promote high-quality apprenticeship opportunities for high school-age youth across the country. Although the majority of U.S. adolescents go directly to work after leaving high school, they receive little assistance in that transition during their school years. As a result, many high school graduates spend until age 23 or 24 "lost" in a string of dead-end jobs that teach them few new skills until they finally move into the mainstream labor force. High school guidance systems are set up to assist the college-bound at the expense of the other 75 percent of the student population that enters the workforce. For example: According to the Association for Curriculum Development (ASCD), the little curriculum focuses on the needs of non-college-bound students. Few employment services exist for those who go immediately to work. Few guidance services are available for non-college-bound students. No certification recognizes or verifies the accomplishments of students who are not on an academic track. Teachers' expectations are considerably lower of students who are not in the academic, college-bound curriculum. "By creating opportunities for young people to earn a post-secondary credential and make a living at the same time through structured apprenticeships, we can not only help repair the education-employment pipeline but also begin to address the pervasive inequities that exist within it," says Gerber. Over the next four years, PAYA's members hope to improve public understanding of youth apprenticeship, gather and share information about what is necessary for success and -- through grants and direct assistance -- expand access to young people. Youth apprenticeship is a time-tested model perfectly suited for employers who need skilled workers and young people who need affordable pathways through college and the skills, experience, and networks that come with a real job," says Anne-Marie Slaughter, president, and CEO of New America. "[We're] delighted to help build a network of innovators committed to bringing the many benefits of youth apprenticeship to communities across America. For more information on the local PAYA initiative, contact School-to-Work Pathways, 989-239-4974, or access our website at www.school-to-workpathways.org.